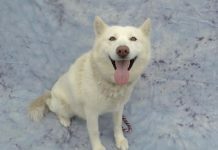 In the past, if you wanted to adopt a pet you had to find a reputable adoption center, drive there, and then search for a pet that suited you best. These days, thanks to Catty Wagon, an pet adoption center can now come to you. Catty Wagon goes into local neighborhoods every weekend and is one of the first custom-built mobile adoption centers that caters to kittens a way to help thousands of shelter kittens find loving homes. The Catty Wagon, a yellow truck that resembles a giant cat with ears and whiskers, will be on site at this year’s Fiesta La Ballona at Veterans Park in Culver City. “They [potential pet adopters] think its really cute because the catty wagon itself has ears and a tail so a lot of people like that and they like that since there are kittens, they get to play with [them],” Tracy Soriano, Retail and Adoption Associate, said. According to the company’s website, one thing that is unique about the Catty Wagon is how it combines pet adoptions and retail products, allowing potential pet owners to adopt and then purchase all of the supplies they will need to care for their new pet in one convenient practically at their front door. Inside of the Catty Wagon are six individual pods where the cats up for adoption are housed. Potential adopters can see all cats up for adoption through the glass windows attached to each pod. From there, they can get up close and personal with the cat of their choice in one of two “meet and greet” rooms in the Catty Wagon. Each adoptable pet on board the Catty Wagon will be vaccinated, spayed/neutered, and microchipped, ensuring that all lost pets are returned home and not back to a shelter, according to a Culver City Observer story on the mobile adoption center. The purpose of the Catty Wagon, which has been in operation for about a month, is to not only serve as a mobile adoption center, but to also serve as an extension of Adopt & Shop, its dedicated store where animal lovers can come in to adopt a pet. Catty Wagon supports Adopt & Shop’s mission of saving pets and enriching lives. They offer pet adoptions, pet supplies, grooming and dog daycare, all in one location. 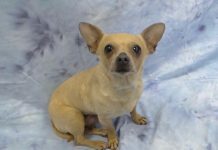 All Adopt & Shop pets come from local shelters and as a nonprofit, all of the profits go back into programs to save more pets. With the goal of reducing the number of shelter pets that are euthanized, Catty Wagon and Adopt & Shop offers a way to make customers part of that mission. The Catty Wagon came into being thanks to the Michelson Found Animals Foundation, an independent non-profit organization that has spent the last 10 years finding good homes for pets. According to the ASPCA, more cats (1.4 million) than dogs (1.2 million) are euthanized each year in animal shelters in the United States. Catty Wagon is a step toward reducing those numbers. 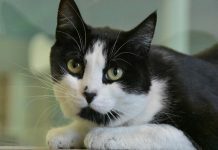 For more information on the Michelson Found Animals Foundation, visit www.FoundAnimals.org. 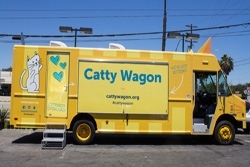 For more information on the Catty Wagon, visit www.cattywagon.org.